In the heavily armed conflict that is motocross, the ultimate 4-stroke weapon has just been deployed – the all-new 2006 Kawasaki KX™450F. With the world’s most advanced 4-stroke engine plus Kawasaki’s all-new aluminum perimeter frame, it’s engineered for one reason, pure and simple: To absolutely dominate the premier motocross class, from the amateur ranks all the way to the pros. Without apology. Without pity. And completely without mercy. The 449cc ultra-short stroke DOHC 4-stroke engine was designed from the ground up with winning technology like hand-finished intake ports, titanium intake/exhaust valves, magnesium engine covers, and a full titanium tapered exhaust with aluminum silencer to provide the best acceleration and widest powerband in the class. 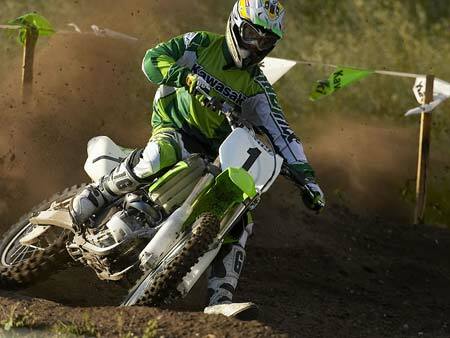 And thanks to a wide-ratio 4-speed transmission, the KX450F gets power to the ground with incredible effectiveness. With over 10 years perfecting perimeter frames, the astonishing power of the KX450F is matched by superb control thanks to our all-new aluminum frame. Coupled with a fully tunable Kayaba 48mm twin-chamber inverted fork and completely revised UNI-TRAK® rear suspension with new linkages plus high and low speed compression adjustment on the shock, the KX450F handles like a 250. Altogether, it makes the KX450F the latest, most potent and most powerful premier MX package your money can buy. Kawasaki, the brand that introduced the motocross world to perimeter frames and awe-inspiring powerbands, has unveiled an all-new flagship in its leading-edge KX™ motorcycle line. Kawasaki engineers stressed every detail on the new, liquid-cooled, 449cc four-stroke engine to ensure that its provides maximum power and traction. Featuring double overhead cams, four valves and a Keihin FCR40 carburetor, it combines amazing acceleration with smooth over-rev capability so the rider can use very ounce of its incredible power on the racetrack. Hand-finished intake ports maximize intake efficiency, while lightweight titanium valves and aluminum valve retainers reduce reciprocating weight for reliable valve control at high rpm. Plus, double valve springs provide stable operation under intense racing conditions. To ensure quick and easy starting, the KX450F features both an automatic compression release and hot start system. The KX450F utilizes newly designed, high-capacity Denso radiators, which provide superior cooling under racing conditions. With its tightly packed radiator cores and new fin design, the new radiators improve heat dispersion for consistent engine power characteristics and dependability. The KX450F comes equipped with a tapered titanium exhaust pipe that expands in diameter from 38 to 41mm, contributing to its broad powerband, and the silencer features new, long-fiber packing. Kawasaki engineers have matched the high-tech engine to a new four-speed transmission. Combined with a manual, multi-disc wet clutch, the four-speed transmission enables the rider to take advantage of the engine’s inherently broad powerband on the racetrack; from accelerating out of turns to high-speed straights, the rider can use the KX450F’s precise throttle control to adjust speed nearly instantaneously. And to protect the underside of the engine and transmission, the KX450F comes with a lightweight aluminum skid place. 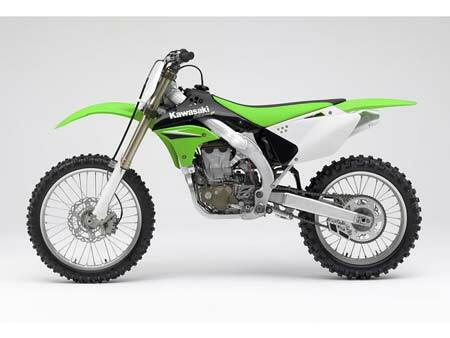 The KX450F chassis has been designed to help the rider put the engine’s power to the ground. To do this, Kawasaki engineers combined their experience designing steel perimeter KX frames and techniques used to construct the Ninja® ZX™-10R sport bike chassis to create an all-new aluminum perimeter frame. Comprised of forged, extruded and cast aluminum parts, the strong twin-spar design gives the KX450F optimum balance of torsional and longitudinal rigidity. 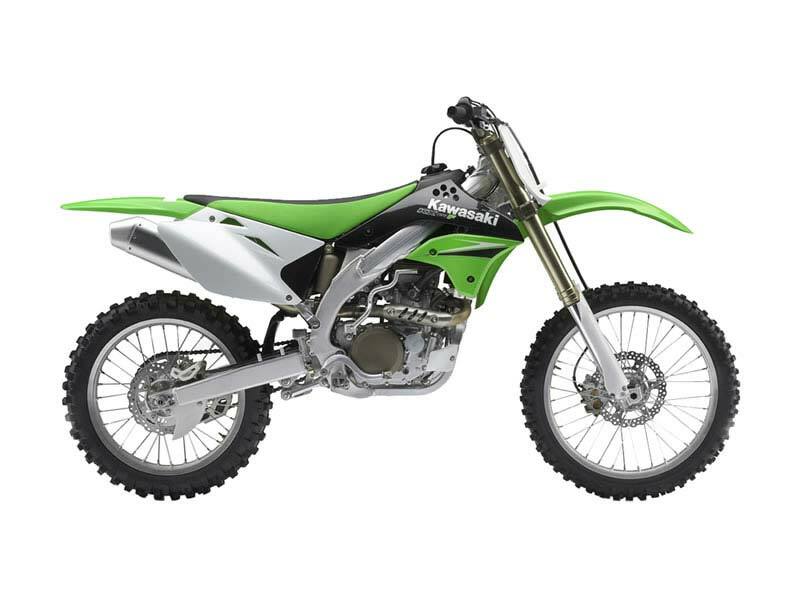 The frame was designed so that the center of gravity and key chassis dimensions would work together to enhance the rear tire’s ability to drive the KX450F forward instead of squatting under acceleration. Additionally, the four-stroke engine sits in an upright position within the new frame to further aid overall traction. Kawasaki then added complementary front and rear suspension to the KX450F. A Kayaba AOS (Air-Oil-Separate) fork keeps oil and air in separate chambers for stable damping performance during long motos. On the rear, the UNI-TRAK® rear suspension system features an alloy swingarm with tapered spars and linkage ratios to maximize traction under acceleration. Front and rear petal disc brakes provide stopping power for the KX450F. This design not only helps to reduce unsprung weight, but the petal shape of the discs helps to clean the brake pads for more efficient braking performance. The slim profile of the KX450F frame, two-piece radiator shrouds that leave the upper frame spars exposed, and careful design of the remaining bodywork make the KX450F feel light and narrow beneath the rider. The KX450F comes with a Renthal aluminum handlebar, while the seat uses a slip-resistant top surface for good grip when seated and smooth sides for enhanced rider mobility. The KX450F also features titanium footpegs and footpeg brackets for reduced overall weight. Complementing the KX450F’s ultra-high-performance design is aggressive bodywork and graphics. Kawasaki offers a number of optional parts for the KX450F, including a top mounting clamp for an oversized handlebar, aluminum and steel rear sprockets, solid petal disc brake rotors for wet racing conditions, optional springs for the front fork and rear shock, and a 20-inch front wheel. Those who race their KX450F at designated events are eligible to receive support from Team Green™, Kawasaki’s amateur racing support program. Each year, Team Green provides regional support vehicles and highly trained technicians at more than 100 events, offering technical information and assistance to those who race Kawasaki products. Kawasaki also offers a comprehensive contingency program for amateur and professional riders who place well at designated events. Rake / trail: 27 degrees / 4.6 in. Front suspension / wheel travel: 48mm inverted AOS-type telescopic fork with 22-way compression damping and 20-way rebound damping / 12.4 in. Rear suspension / wheel travel: UNI-TRAK® linkage system with 22-way compression and rebound damping, and fully adjustable spring preload / 12.4 in.